The Convair B-36 was a strategic bomber built by Convair for the United States Air Force, the first to have truly intercontinental range. Unofficially nicknamed the "Peacemaker," the B-36 was the first thermonuclear weapon delivery vehicle, the largest piston aircraft ever to be mass-produced, and the largest warplane of any kind. Although there have been larger military aircraft, they have all been transports. The genesis of the B-36 can be traced to early 1941, prior to the entry of the US into World War II. At the time it appeared that there was a very real chance that Britain could fall, making a strategic bombing effort by the US against Germany impossible. A new class of bomber would be needed to fill this role, one that offered trans-Atlantic range so that it could bomb targets in Europe from bases inside the continental USA. The United States Army Air Corps opened up a design competition for the very long-range bomber on 11 April 1941, asking for a 450 mph top speed, a 275 mph cruising speed, a service ceiling of 45,000 feet, and a maximum range of 12,000 miles at 25,000 feet. These proved too demanding for any short-term design, so on August 19, 1941 they were reduced to a maximum range of 10,000 miles, an effective combat radius of 4,000 miles with a 10,000 pound bombload, a cruising speed between 240 and 300 mph, and a service ceiling of 40,000 feet. After the Cold War began in earnest with the 1948 Berlin airlift and the 1949 atmospheric test of the first Soviet atomic bomb, American military planners sought bombers capable of delivering the very large and heavy first-generation nuclear bombs. The B-36 was the only American aircraft with the range and payload to carry such bombs from airfields on American soil to targets in the USSR, as storing nuclear weapons in foreign countries was (and remains) diplomatically delicate. The nuclear deterrent the B-36 afforded may have kept the Soviet Red Army from fighting alongside the North Korean and Chinese armies during the Korean War. The B-36 was arguably obsolete from the outset, because it was piston-powered in a world of jet interceptors. But its jet rival, the B-47 Stratojet, which did not become fully operational until 1953, lacked sufficient range to attack the Soviet heartland from North American airbases and could not carry the huge first-generation hydrogen bomb (Neither could the other American piston bombers of the day, the B-29 Superfortress and its later revision the B-50). Intercontinental ballistic missiles (ICBMs) did not become effective deterrents until the 1960s. Until the B-52 Stratofortress became operational in the late 1950s, the B-36, as the only truly intercontinental bomber, was the mainstay of the Strategic Air Command (SAC). Convair touted the B-36 as an "aluminum overcast," a "long rifle" to give SAC a global reach. When General Curtis LeMay headed SAC (1949-57) and turned it into an effective nuclear delivery force, the B-36 formed the heart of his command. Its maximum payload was more than four times that of the B-29, even exceeding that of the B-52. The B-36 was slow and could not refuel in the air, but could fly missions to targets 3,400 miles (5,500 km) away and stay aloft as long as 50 hours. Moreover, the B-36 was believed to have an ace up its sleeve: a high cruising altitude, made possible by its huge wing area, that put it out of reach of all piston fighters and early jet interceptors. Nevertheless, the B-36 was difficult to operate, prone in its early service years to catastrophic engine fires and other costly malfunctions. To its critics, these problems made it a "billion-dollar blunder". In particular, the United States Navy saw it as a costly bungle that diverted funding and interest from their pet project, aircraft carrier–based nuclear bombers. In 1947, the Navy attacked Congressional funding for the B-36, alleging that the aircraft failed to meet Pentagon requirements. The Navy believed that the dominance of the aircraft carrier in the Pacific during World War II proved that carrier-based air strikes would be decisive in future wars. To this end, the Navy designed United States, a "supercarrier" capable of launching huge fleets of aircraft — or nuclear bombers. It then pushed to have funding transferred from the B-36 to the United States. 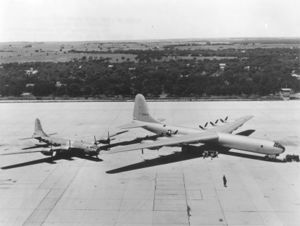 The Air Force successfully defended the B-36 project, and the United States was officially cancelled by Secretary of Defense Louis A. Johnson. Several high-level Navy officials questioned the government's decision, alleging a conflict of interest because Johnson had once served on Convair's Board of Directors. The uproar following the cancellation of United States was nicknamed the "Revolt of the Admirals". The furor resulted in the immediately following Forrestal class of supercarriers, with very similar specifications. In 1941, the fall of Britain to a German invasion seemed imminent. This would have left the United States Army Air Corps (AAC) with no bases in Europe from which to bomb Germany. American bombers would have needed to reach Europe from bases in North America. Doing so would require a combat range of at least 9200 km, the length of a Gander, Newfoundland–Berlin round trip. Hence the AAC sought a bomber of truly intercontinental range. On 11 April 1941, the AAC announced a design competition for an aircraft with a 275 mph (445 km/h) cruising speed, a service ceiling of 45,000 ft (14,000 m), capable of delivering 10,000 lb (4,500 kg) of bombs to targets 10,000 miles (16,000 km) away. These requirements far exceeded the technology of the day. The B-36 concept began with a proposal by Consolidated Vultee Aircraft Corporation (later CONVAIR) to meet this requirement; the same design request led to the Northrop YB-35. Though the need to bomb Germany from North American bases never arose, the project was not canceled because the B-36 was seen as playing a possible eventual role in the Pacific war. The B-36 took shape as an aircraft of immense proportions. It was two-thirds longer than the previous superbomber, the B-29 Superfortress. Its wingspan and tail height exceeded those of the Antonov An-22, the largest ever mass-produced propeller-driven aircraft. The wingspan of the B-36 exceeded even that of the C-5 Galaxy. 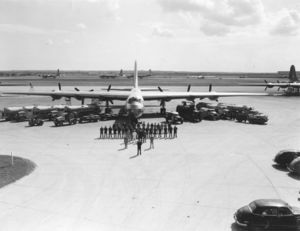 Only with the advent of the Boeing 747 and the C-5, both designed two decades later, did aircraft larger than the B-36 and capable of lifting a heavier payload, become routine. The propulsion system of the B-36 made it a very unusual aircraft. All B-36s featured six Pratt & Whitney R-4360 Wasp Major radial piston engines, with 28 cylinders displacing 4,360 in³ (71.4 L). Each engine drove an immense three-bladed propeller, 19 ft (5.8 m) in diameter, mounted on the trailing edge of the wing. The pusher configuration, though rarely used, prevented propeller turbulence from interfering with airflow over the wing. Even though the prototype R-4360 engines delivered a total of 18,000 hp (13.4 MW), early B-36s were slow and required long takeoff runs. The situation improved with later versions of the R-4360, delivering 3,800 hp (2.8 MW) apiece for a total 22,800 hp. Beginning with the B-36D, Convair suspended a pair of General Electric J47-19 jet engines from each wing; these engines were also retrofitted to all extant B-36Bs. The jet pods greatly improved takeoff performance and dash speed over the target. In normal cruising flight, the jet engines were shut down to conserve fuel. Thus the B-36 came to have ten engines, more than any other mass-produced aircraft. If all engines functioned normally at full power during the pre-takeoff warm up, the lead flight engineer would say to the captain "six [engines] turning and four [engines] burning". Erratic reliability led to the wisecrack "two turning, two burning, two joking and two smoking," with two engines not accounted for. The B-36 required a standard crew of 15. As in the B-29, the pressurized flight deck and crew compartment were linked to the rear compartment by a pressurized tunnel through the bomb bay. In the B-36, one rode through the tunnel on a wheeled trolley, by pulling oneself on a rope. The rear compartment led to the rear gun turret, and featured six bunks and a galley for long missions. The XB-36 featured single-wheel landing gear requiring the largest tires ever manufactured up to that time, 9 ft, 2 in (2.7 m) tall, 3 ft (1 m) thick, and weighing 1,320 lb (600 kg), with enough rubber for 60 automobile tires. These tires placed so much weight per unit area on runways that the XB-36 was restricted to the Fort Worth airfield where it was manufactured, and to a mere two USAF bases. At the suggestion of General 'Hap' Arnold the single-wheel landing gear was soon replaced by a more conventional four-wheel bogie. At one point a tanklike tracked landing gear was also tried on the XB-36, but proved heavy and noisy and was quickly abandoned. The four bomb bays could carry up to 86,000 pounds of bombs, more than five times the load carried by the WWII workhorse, the B-17 Flying Fortress. The B-36 was not designed with nuclear weaponry in mind, because the mere existence of such weapons was top secret during most of the period when the B-36 was engineered (1941-46), and their mode of delivery had yet to be determined. Nevertheless, the B-36 stepped into a nuclear delivery role immediately upon becoming operational. In all respects but speed, the B-36 could match what was arguably its Soviet counterpart, the Tu-95 (still in service). Until the B-52 came on line, the B-36 was the only means of delivering the first generation Mark-17 hydrogen bomb, 25 feet (7.5 m) long, 5 ft (1.5 m) in diameter, and weighing 42,000 lb (19,000 kg), the heaviest and bulkiest American nuclear weapon ever. Carrying this massive weapon required merging two adjacent bomb bays. The defensive armament consisted of six remote-controlled retractable gun turrets, and fixed tail and nose turrets. Each turret was fitted with two 20 mm cannon, for a total of 16 cannons, the greatest defensive firepower ever carried by a bomber. Recoil from gunnery practice could cause the on-board electronics to malfunction, solid state then being unknown. This contributed to the crash of B-36B 44-92035 on 22 November 1950. I removed the 6 movable gun turrets and other defensive hardware. II removed the rear compartment crew comfort features, and all hardware accommodating the XF-85 parasite fighter. III incorporated both I and II. The six turrets eliminated by I reduced the crew from 15 to nine. III enabled a longer range and an operating ceiling of at least 47,000 feet (14,000 m), features especially valuable for reconnaissance missions. The B-36J-III configuration (the last 14 made) featured a single radar-aimed tail turret, extra fuel tanks in the outer wings, and landing gear allowing the maximum gross weight to rise to 410,000 pounds (190,000 kg). Production of the B-36 ceased in 1954. Unlike the B-52, which has seen action in the Vietnam War and the two Gulf Wars, no B-36 ever dropped a bomb or fired a shot at an enemy. The closest the B-36 came to seeing action was during the 1956 Hungarian Revolution and the Suez Crisis, when nuclear-armed B-36s were dispatched to Turkey and Morocco. Though the B-36 had a better than average overall safety record, ten crashed between 1949 and 1954 (three 36Bs, three 36Ds, and four 36Hs). Goleta Air and Space Museum maintains a web site with photographs and lengthy excerpts from the official crash reports. A B-36 was also involved in two "Broken Arrow" incidents. On 13 February 1950, a B-36, serial number 44-92075, crashed in an unpopulated region of British Columbia, resulting in the first loss of an American nuclear weapon. On 22 May 1957, a B-36 accidentally dropped a Mark-17 hydrogen bomb on a deserted area while landing at Kirtland AFB in Albuquerque NM. Only the conventional trigger detonated, the bomb being unarmed. These incidents were classified for decades. See list of military nuclear accidents. The B-36 was too large to fit in most hangars. Moreover, even an aircraft with the range of the B-36 needed to be stationed as close to the enemy as possible, and this meant the northern USA, Alaska, and the Arctic. As a result, most "normal" maintenance, such as changing the 56 spark plugs (always at risk of fouling by the leaded fuel of the day) on each of its six engines, or replacing the dozens of bomb bay light bulbs shattered after a gunnery mission, was performed out of doors, in 100-degree summers and 60-below winters. Special shelters were built so that the maintenance crews could enjoy a modicum of protection while working on the engines. Often, ground crews risked slipping and falling from ice-covered wings, or being blown off by a propeller running in reverse pitch. Some procedures even required a mechanic to sit astride a running engine, a 19-foot diameter propeller at his feet, his hand near the 34-inch diameter cooling fan. The Wasp Major engines also had a prodigious appetite for lubricating oil, each engine requiring a 100 gallon (380 L) tank. A former ground crewman has written: "[I don't recall] an oil change interval as I think the oil consumption factor handled that." It was not unusual for a mission to end because one or more engines ran out of oil. Though the B-36 could continue flying with as many as three inoperative engines, the extra stress on the remaining engines put them at risk of failing. Like all large aircraft powered by piston engines, the B-36 was prone to engine fires, a problem exacerbated by the pusher configuration. When a crash occurred for any reason, the magnesium-rich airframe burned readily. The ambient temperatures typical of the B-36's cruising altitude and of the high latitude bases where it was often stationed, were usually far below freezing. Radial aircraft engines like the R-4360 are air-cooled. Hence the large volume of air flowing past the cylinders during flight underwent substantial warming. Because the carburetor is now in front of the engine, it cannot benefit from engine heat. Hence when the intake air was cold and humid, ice gradually obstructed the carburetor air intake, increasing the richness of the air/fuel mixture, until the unburned fuel in the exhaust caught fire. Engine fires of this nature led to the first loss of an American nuclear weapon, described above. Adding electric heating to the carburetor intakes eliminated the problem. The highest cruising speed of any version, the B-36J-III, was only 230 mph (380 km/h). Turning the jet engines on could raise the cruising speed to over 400 mph (650 km/h), but the resulting higher fuel consumption reduced the range. Hence a 40 hour mission, with the jets used only for takeoff and climbing, flew about 9200 miles (15000 km). Many missions were flown "around the flag pole"; they began and ended at the same base. The B-36 was not a sprightly aircraft: Lieutenant General James Edmundson likened it to "...sitting on your front porch and flying your house around." Despite its immense exterior size, the pressurized crew compartments were relatively cramped, especially when occupied for 24 hours by a crew of fifteen in full flight kit. Although the rear compartment included six bunks, and the radio compartment behind the flight deck included a couple of bunks, crewmen usually chose to sleep in their seats. War missions would have been essentially one-way: taking off from forward bases in Alaska or Greenland, overflying the USSR, and landing in Europe or the Middle East. The recollections of crew veterans reveal that while crews were confident of their ability to complete a mission if called upon to do so, they were less confident of surviving the weapon delivery itself. These concerns were borne out by the 1954 Operation Castle tests, in which B-36s flew near atmospheric detonations in the 15 megaton range, at distances believed typical of wartime delivery, and experienced serious heat and blast damage. More successful was the FICON project, involving a modified B-36, a GRB-36D "mothership", fighter modified for reconnaissance, the RF-84K, in a bomb bay. The B-36 would ferry the RF-84K to the vicinity of the objective, whereupon the RF-84K would disconnect and begin its mission. Ten GRB-36Ds and 25 RF-84ks were built and saw active service until 1959. The B-36 was gradually decommissioned as the B-52 entered service. Only four (and a half) aircraft survive from the 384 produced. YB-36/RB-36E serial number 42-13571. This was the first prototype to be converted to the bubble canopy used on production B-36s. It was on display in the 1950s at the former Air Force Museum on Wright-Patterson Air Force Base near Dayton, Ohio. 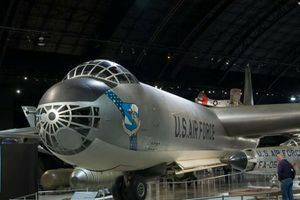 When the Museum was moved to a different location on the base the cost of moving the bomber was more than simply flying a different B-36 to the new location and the aircraft was slated to be scrapped. Instead, Walter Soplata bought it and transported the pieces by truck to his farm in Newbury, Ohio, where it sits today in several large pieces. The center fuselage currently stores a complete P-47N still contained in its original shipping crate. RB-36H serial number 51-13730, is on display at the Castle Air Museum in Atwater, California. B-36J serial number 52-2217, is on display at the Strategic Air and Space Museum (formerly located at Offutt Air Force Base) and now near Ashland, Nebraska. B-36J, serial number 52-2827, the final B-36 built, named "The City of Fort Worth," was scrapped on 12 February 1959 and is now undergoing restoration and reassembly at the Pima Air & Space Museum in Tucson, Arizona. In 1951, the USAF asked Convair to build a prototype all-jet variant of the B-36. Convair complied by adding swept wings and eight Pratt & Whitney XJ57-P-3 jet engines to a B-36F. 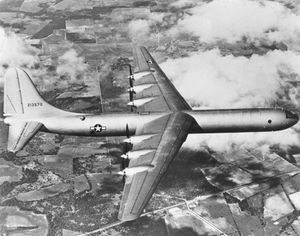 The result was the B-36G, later renamed the Convair YB-60. Although the YB-60 could carry a heavier bomb load than the YB-52, it did not go forward because it was also over 100 mph (160 km/h) slower and suffered from handling problems. The B-36 was the basis for the Convair XC-99, a double-decked military cargo aircraft, the longest practical aircraft (185 ft, 56 m) of its era. Only one example was ever built; it was extensively employed for nearly a decade, especially for cross-country cargo flights during the Korean War. In 2005, the XC-99 was dismantled and moved from the former Kelly Air Force Base in San Antonio, Texas, where it has been retired since 1957. It is currently being transported in pieces to the National Museum of the United States Air Force at Wright-Patterson Air Force Base near Dayton, Ohio aboard C-5 Galaxy transports as space and schedule permits. 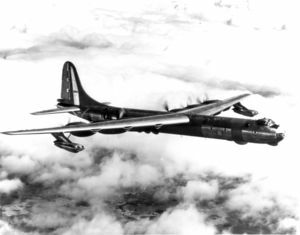 The B-36 appeared in only one feature-length motion picture, Strategic Air Command (1955), starring Jimmy Stewart and June Allyson. In the film Jimmy Stewart's character is forced to crash land his B-36 in the Arctic. Strategic Air Command features many good aerial shots of B-36s and B-47s. Video clip of the construction and features of the B-36 bomber. ↑ Wagner 1968, p. 142. 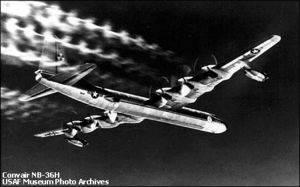 Quote: "A British engineer attacking 'piston-engined giantism,' wrote that British jets could reach B-36 height in less than eight minutes, were far faster at high altitudes, and would find the B-36 'practically a sitting duck.'" ↑ From the Maxwell Air Force Base website (original image). ↑  Quote attributed to Captain Banda when he toured an air cadet Michael R. Daciek, later Lt. Col. Daciek, on an inside toour of the XC-99 in 1953. ↑ Convair XB-36 Peacemaker. National Museum of the United States Air Force. Access date: 4 September 2006. ↑ An image of the four-wheel landing gear may be found here. ↑ Convair XB-36 Landing Gear. National Museum of the United States Air Force. Access date: 4 September 2006. ↑ Lockett, Brian. Parasite Fighter Programs: Project Tom-Tom.Goleta Air and Space Museum. Access date: 3 February 2007. Access date: 3 February 2007. Pyeatt, Don. B-36: Saving the Last Peacemaker (Third Edition). Texas: ProWeb Publishing, 2006. ISBN 0-9677593-2-3. This page was last edited on 6 March 2007, at 02:17.